Be sure to read the followup. 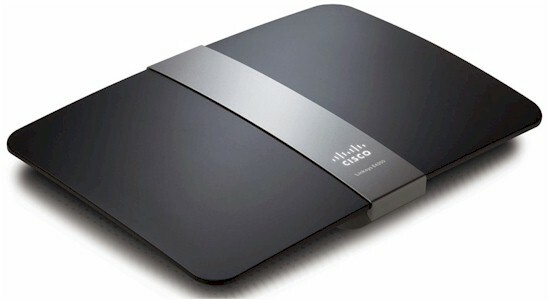 By dubbing its new top-of-line wireless router "Maximum Performance", Cisco is trying to send a not-so-subtle message that its Linksys E4200 is the new big dog in Wi-Fi town. Of course there are always Super, Ultra, Grande and even "Extra Special Good" left as superlatives for new routers to come. So don't think there will never be a better performing router. But there might not be a more attractive one. Cisco has taken sort of a "Danish modern" styling approach that looks like it came from Bang and Olufsen. Cisco definitely wants high WAF for the E4200 so that it doesn't get hidden in a cabinet or basement furnace room. There's only one front panel light, a steadily-lit white backlit Cisco logo that blinks while booting or during a firmware update or Wi-Fi Protected Access session. All the other lights are on the back panel (Figure 1), i.e. link / activity for one Gigabit WAN and four switched Gigabit LAN ports. There are no wireless activity indicators at all. Also on the back panel are one USB 2.0 port for drive sharing and media serving (but still can't be used for printer sharing), Wi-Fi Protected Setup (WPS) pushbutton, recessed reset switch and power port. Not surprisingly, Cisco has stuck with Broadcom for its latest and greatest creation. But the E4200 is not just another rebranding of the WRT610 V2 / E3000. Cisco has asked the FCC to block access to the internal photos and other documents until Jan 30. So I had to open up the review unit that Cisco sent. Figure 2 shows the board with cover removed. Both radios have three antennas—5 GHz on the left and 2.4 GHz on the right. Many of the key components have shields over them. But you can see a Broadcom BCM4331 Single-Chip 802.11n Dual-Band 3x3 parked next to the 5 GHz shielded area. Also visible are Macronix MX25L12845E 16 MB flash and Hynix H5PS5162FFR 64 MB RAM devices. Note the BCM4331 is three-stream N capable. To get the rest of the component details, I had to remove three shields and one heatsink to reveal the view in Figure 3. Under the heatsink was a Broadcom BCM4718 Intensi-fi XLR 802.11n Simultaneous Dual-Band (2.4/5 GHz) Router System-on-Chip, which serves as the main CPU and 2.4 GHz radio. This device is also used in the E3000 as CPU but as the 5 GHz radio. Under the shield above the BCM4718 was a Broadcom BCM53115 Gigabit switch, again the same as used in the E3000. I've removed the thermal pad that couples the device to its shield cover to act as a heatsink for the switch. The devices under the shields next to the two radios are RF amplifiers and switches, two SiGe 2528L 2.4 GHz power amps for 2.4 GHz and three SiGe SE2594L Dual Band 802.11a/b/g/n Wireless LAN front ends for 5 GHz. The use of only two power amps and BCM4718 for the 2.4 GHz radio says that it can't be software-enabled for three-stream N; it's two-stream only. Figure 4 shows the E3000's board for reference.